@Calgary. Out of curiosity I took a look at the Sunrise Adoption page you linked above. They are to be commended for providing fair warning regarding the adoption of US born children. Unfortunately, at the same time they are spreading incorrect information about the subject. For example, they mention renunciation as a way of eliminating US citizenship complications. We all know it is effectively impossible for a minor child to renounce their US citizenship. There is no realistic chance of that happening until age 18. They then go on to state that one cannot renounce US citizenship without being totally up to date on all US tax filing and informational reporting (FBARs) obligations. We all know that is not true, either. I suppose such misinformation is not really surprising considering how complicated the subject is. Perhaps someone needs to gently encourage Sunrise Adoption to correct and update what is obviously a good faith attempt to provide useful and important information. Thanks. The link you provided no longer goes to direct information on children adopted from the US, but a search of international adoptions say this adoption from the US have decreased. No surprise there! I too noticed the inaccuracies in the Sunshine article (with updated link) but they are relatively minor points. They are at least well-intentioned in terms of warning potential adoptive parents. - became a Canadian citizen using the citizenship process for intercountry adoption. However, if your children’s other parent was born in Canada or is a naturalized citizen, your children will become citizens through them. NOTE: A child born to two U.S. citizens, out of wedlock should refer to number 3 or 4 below (whichever favorably applies). NOTE: All periods of residence or physical presence must have taken place prior to the birth of the child. Adopted children or children under 18, born to U.S. citizens who are not eligible for U.S. citizenship as described above may be eligible under the Child Citizenship Act of 2000. Further information is available from the Department of State’s website. If you are over 18 and believe you have a claim to U.S. citizenship, please review our citizenship information page. Thanks for pointing that out, which needs to be pointed out to the Sunrise people so they can correct on their site. I’ll try to find a link appropriate to send to them to back up what we know, which differs from their information — tomorrow. Impt. as no other headlines around it; i.e., it stood out. (In big letters at the centre was news about NKorea — unrelated). The text has little new to Brockers but it’s a great in terms of the problem’s continuing visibility. Plus, here’s Dan Mitchell again prodding (iin as many words) Republicans to repeal FATCA. Impt too:: blames Obama. Pls. also note that Drudge Report is a conservative website and influential at that. Among other things, it keeps tabs on Republicans in Congress urging them to get on w/the GOP agenda. The other headline this afternoon (unveiled earlier, I believe): Obamacare replacement. Since Republicans have said that tax reform will follow Obamacare replacement –a few days ago Mnuchin indicated by August– and since tax reform should include FATCA repeal, I’m thinking this is impt context (and perhaps the takeaway that is not being explicitly noted). A child renouncing at age 18 isn’t likely to have enough money in an account to trigger a Fincen Form 114 filing and they aren’t likely to have had enough income that they need to file a tax return. And if they have a substantial RESP or any other tax-protected savings accounts in their name, those are exempt from FATCA under the terms of the IGA, so they needn’t complicate matters by reporting them. To my original point, a child born in Canada has no US indicia (adopted or not; regardless of their biological or adoptive parents’ citizenship) so they won’t be identified by FATCA and can remain safely and happily non-compliant. 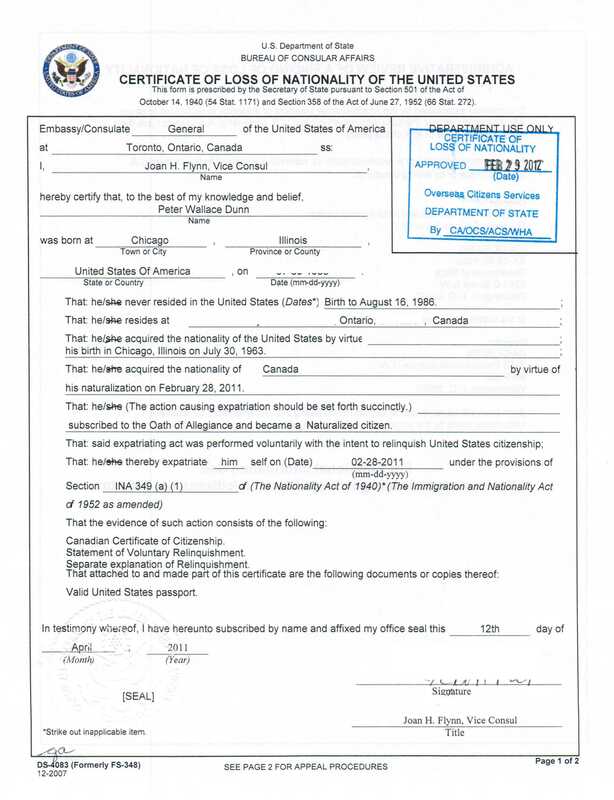 A child born in the US and adopted by Canadians may have an issue, depending on what sort of documentation they are given in lieu of a birth certificate. If there are no US indicia on the documents they need to open bank accounts, they avoid FATCA and can skip compliance. In Canada, this discussion is almost entirely moot because Canadian banks do not yet demand proof of non-US-personhood. It’s generally sufficient to simply say that you are not a US citizen when asked by a financial institution, and if they do not follow up or demand confirmation, you are not flagged for FATCA. And without FATCA, there’s no real point to compliance. I have sent information through Sunrise’s online contact page. Among other things, I referred them to the IRS instructions for Form 8854, timing of filing of that form, etc., and said that a person will never (or should never) be asked about their US tax and FBAR compliance in their renunciation procedure that takes place at a US Consulate within Canada (or any other country outside the USA). “First off, I want to say thanks so much for bringing this to my attention. I’m going to look into this in more depth over the next few days and I’ll get back to you – I want to speak with some US Hague attorneys about the renouncing of US citizenship. I read the Immigration laws in the link you sent, and unless there is a caveat for adoption or otherwise (which as you said, it doesn’t seem like there is), then this has enormous impact on all families formed by adoption through the US. I don’t think these laws have affected adoption numbers overall, although I can only speak for what I’ve heard from families I’ve spoken to over the past 5 or 6 years. Most seem to take the attitude “I’ll worry about that when the time comes”, not realizing that the time is sooner than they expected and babies don’t stay babies for long! I think the declining numbers (assuming you mean post-Hague, as obviously the Hague ratification has an enormous impact as well) are more to do with the enormous cost of the program, made worse by plummeting exchange rates. Agencies could certainly have a role in creating awareness around this issue – and really almost have an obligation to do so (in the sharing of information, but might be limited in the advocating for legal reform). According to Wikipedia, that’s precisely where the father having to claim the child came from – the Vietnam War. As I’ve said, it seems US soldiers are allowed to spread their seed as indiscriminately as they do their bombs without any serious repercussions. I believe that this is being challenged in court as discriminatory. Maybe others have more up to date information on that. I don’t think one has to be in the 1% to deliver newspapers, program computers, and have US$10,000 in a savings account by age 18. TD didn’t demand that I send them their version of W8, and maybe I shouldn’t have done it, but surely their reason for creating it was that they demand it from some customers. I remember a 60 Minutes report about children of US soldiers and Korean women when the UN authorized taking sides in the Korean War. But it’s been reported on this site (I think by Eric) that the US already implemented this while intending to enter World War II. @nononymous… R.E.S.P.’s are held by the parent, not the child. If a child does not elect to attend college/university, then the R.E.S.P. can be rolled into a R.R.S.P. The portion that the Canadian government contributed is returned to the government so only the portion that the parent contributed will be rolled into the R.R.S.P. The parent must report them on a 3520 and 3520A. The US deems them a foreign trust because the parent may benefit from the interest earned on the R.E.S.P. if it isn’t used by the child and rolled into a R.R.S.P. The parent has to declare it, never the child because it’s held in trust by the parent.